This afternoon Carol Browner appeared on the CNN Situation Room where she didn’t do nearly as good a job answering questions about clean energy and the stimulius as the President and the nation need her to. The stimulus contains more than $115 billion dollars in investment in energy efficiency, renewable energy development, transit, fit-it-first road repair, research and development, experimental projects on carbon sequestration, and manufacturing for next generation vehicles. The scale and comprehensive nature of the investment, by far the largest ever made in the clean energy sector, rivals the investment during the first decade of the Interstate Highway system, and the money spent to put a man on the moon. In other words this is an investment in jobs and prosperity. But when asked by Wolf Blitzer why, essentially, America is wasting its time on the environment and renewables when there are more important issues at stake, like job creation, Browner had only part of the answer ready. She said pursuing this course would help Americans save money. Pretty good as far as it went. But the answer this administration needs to give over and over and over again is that this is a jobs bill. Prior to the crash the clean energy sector was the fastest growing industrial sector in the United States. Even Michigan, which has lost over 400,0o0 jobs this decade, has gained over 3,000 in the last 10 months or in new clean energy industry announcements. The stimulus provides the tax benefits, incentives, inducements, and outright investments to stimulate again the solar and wind industries, to spur development of new batteries, to encourage transit investments, and build new renewable power plants and modern grid. That is job creation. And its job creation in industries that won’t pollute, will help solve climate change, and help the president do as he said he would during the campaign: wean the United States from Mideast oil. 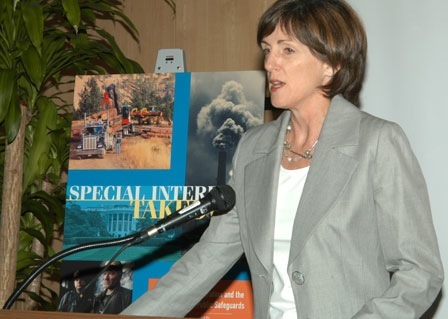 Carol Browner is a smart regulator. She’s a climate change guru. But she’s never been an especially adept communicator. If the administration is going to send her out to make the case for clean energy, she needs to be better prepared with the message. The message is jobs. The old economy, powered by fossil fuels, is dying for obvious reasons. The new economy is emerging. The jobs of the present and the future are in clean energy. The stimulus accelerates the country’s ability to chart a new course. Tens of thousands of new jobs are going to be created with this bill. Carol, if you read this, call me. Heather Zichal, Carol’s deputy, if you read this call me. Get in touch. It’s prime time. I can help.